Since this is a community event, it took place in my neighborhood and as such, I have run this course numerous times before. Typically I only run one loop when I'm running it, but I'm intimately familiar. 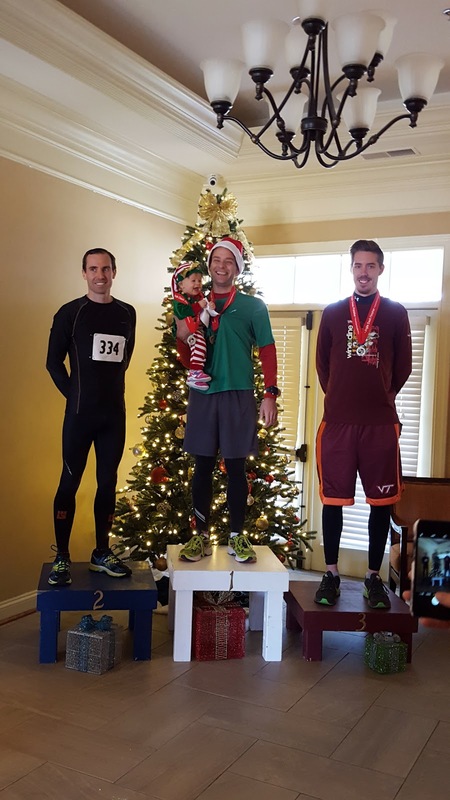 This particular race has a lot of people dressed up in Christmas-themed outfits. A lot of red and green and Santa hats. A few Santa costumes, a few tutus, and even somebody dressed in full firefighter gear. I had a red long-sleeved shirt with a green technical shirt over it. I wore tights and shorts with gloves and a Santa hat. Suffice it to say that I looked pretty Christmas-y as well. Ellie was dressed in an elf costume and was super adorable. My goal for the race was sub 40. My super goal would be a PR which would be sub 39:41. Not a huge difference, but I also wasn't super confident I'd be able to break 40 minutes with my current training regime, which consists of no plan whatsoever. With any community 5k, the front of the chute was filled with kids and people that probably don't quite understand the concept of chip times. But alas, there were no corrals nor direction for how people should sort themselves, so it's hard to be mad. I got my start about 18 seconds after the horn sounded and did my best to avoid people to start the very fast beginning of the race. The first third of the race is all down hill, with the first 200 meters being deceivingly sloped. I immediately got off of the closed road and onto the sidewalk to avoid the traffic and proceeded to run at about a 5:30 pace. Way faster than I could maintain, but with the downhill, and the desire to pass people as quickly as possible, I was OK with that to start. Once I got to the bottom of the slope I reevaluated my pace and dropped to around 6-minute mile pace. 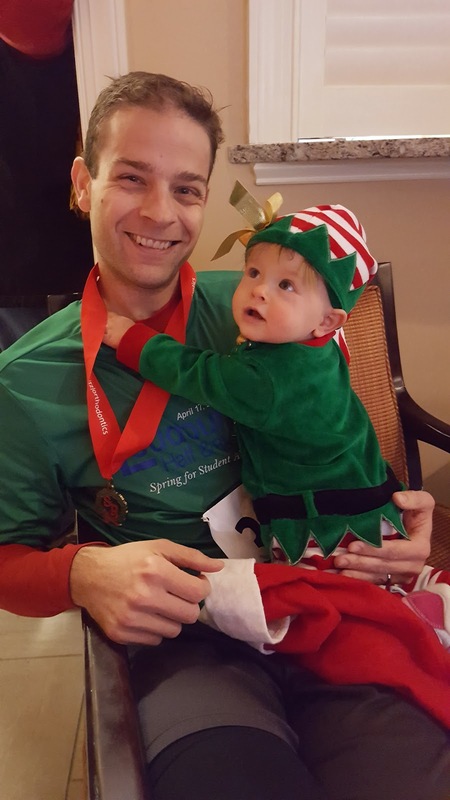 I knew I had to take advantage of the early part of the course and keep my pace well below 6:30 so that I would have a little breathing room during the uphills. Also, it was nice to pass all of the 5k runners during that first mile. 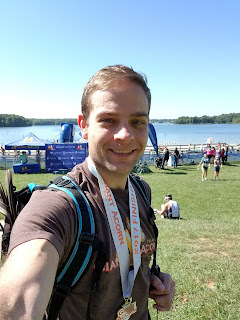 Once I got about halfway through the race, there were only three people in front of me, and I passed one handily going up hill on the back half of the loop. I saw two people in front of me but I was never able to catch up with them. They ended up being the number 1 and 2 overall 5k runners with sub 19-minute efforts. 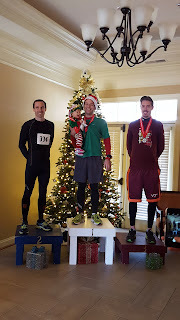 If I had run the 5k, I would have been in third place overall, but I had another lap to go. The second lap is my favorite. It feels like I'm just out on a training run, just me and my thoughts and nobody else. Of course, normally on my training runs I limit my heart rate to ~158, but on this second lap I was hanging around and going about a minute faster per mile than normal. But otherwise totally like a training run. I made sure to keep the gas going on the downhill to start the second lap, banking as much time as I could for the uphill leading into the back half that I was sure would steal some time back. I finished the first lap in 19:30, so I did have a bit of breathing room for my primary goal of breaking 40 minutes. I was also feeling pretty good at that point. Not rested, mind you, but I felt like I could keep up a pace close enough to the one from the first lap to break 40 minutes. I was not expecting a negative split, and I didn't get one. Just prior to the hill where I passed the third place 5ker, a cop who was on traffic duty asked if I was the first 10ker. I said "I hope so!". I honestly wasn't sure. The previous year I never saw the guy that beat me, thought he beat me by 2+ minutes, so that's not surprising. After that, on the back third of the race, on the long straightaway through the park path, I found the majority of the 5k runners. These would be the people that I lapped pretty handily. Granted, most of them were walking, or walk/running (the run/walkers had already finished by that point). Being as familiar with this course as I am, I knew when I would be able to turn it on for the sprint to the finish. I did it with about a quarter of a mile to go and crossed the finish time with a gun time of sub-40 minutes, which meant that my chip time was well below that. 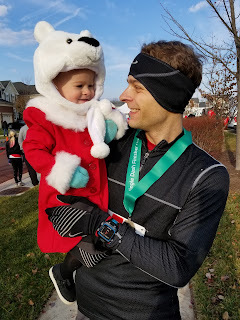 I looked down at my watch and saw that I managed to set my PR, then I looked up and saw my wife, friends, and sleeping daughter waiting for me. I caught up with them and found out that they had finished their 5k a few minutes before me. They weren't racing, but had a nice casual run. Ellie apparently fell asleep almost immediately on the run and remained asleep until it was time for awards almost an hour later. One of the best parts of this race are the refreshments they have after. In addition to coffee and orange juice, they also have a hot chocolate bar and best of all, waffles on a stick. Not only are the waffles on a stick, but they are made to order and come with a choice of a dozen or so toppings. I chose Nutella and cream cheese frosting for mine. We sat around for quite some time. I knew that I was the first overall winner for the 10k, but we had to wait for everybody to finish the course before they would give out the awards. So we sat through the 5k winners, then waited a bit more, and finally nearly two hours after the race started, they did the 10k awards. While I love getting first overall, the pool of competition is not that deep. There's only about 20 or so runners doing that second lap. The second and third place runners were ~42 minutes. Ellie woke up before the awards so I was able to show her off. She got a ton of attention due to her super cute outfit and just ate it up and gave it right back. It was a great event and something I'm looking forward to next year. My next race is the Rock 'N Roll DC Marathon in March. I'm going to pull out my training book and put together a new plan and get to training, because as nice as it is to just get out and go for a run, I need a little structure if I'm going to run farther than I've ever run before.